MOSCOW, Russia, August 27, 2012 (ENS) – Two days after voluntarily ending its occupation of the first permanent oil rig in the offshore Russian Arctic, Greenpeace International has mounted another action to stop Gazprom from drilling in the environmentally fragile area. Early this morning, Greenpeace International Executive Director Kumi Naidoo and six other Greenpeacers headed toward the platform in two high-speed boats to intercept the Anna Akhmatova, a passenger vessel carrying workers to the rig. Two hours later, another two boats with seven more activists arrived on the scene in the Pechora Sea. Now 14 activists from 10 countries have attached themselves to the anchor chain of the Anna Akhmatova and chained their boat to it, preventing the vessel from lifting anchor and sailing out to the Prirazlomnaya oil platform. Half of the oil rig’s work force does not sleep on board. They live on the Anna Akhmatova, which is anchored near the Prirazlomnaya. The Anna Akhmatova tried to move her anchor to transport the crew to work aboard the platform. “They tried raising the anchor a bit (boat gets a bit vertical, activists stay in) and they then tried to lower it a bit (the boat gets filled with water, the activists stay in),” the Greenpeacers said. “The Prirazlomnaya’s chief officer attempts to talk to us, ‘Come on guys, you made your point, you have already got your media coverage, why don’t you leave now.’ Unfortunately for him, the answer is pretty obvious: this is not about PR. It’s about stopping the destruction of the planet!” Greenpeace said. At noon, when another shift from the crew vessel is scheduled to start work on the platform but cannot get there, the chief officer make a decision. He orders two Gazprom stand-by ships to train their high-pressure water cannons onto the Greenpeace boats. The activists get washed out of their boats and thrown together into icy water some distance away. The activists are picked up, the anchor chain is heaved and the activist boat is cut off from it. As the Anna Akhmatova finally starts moving towards the rig, Greenpeace deployed four boats behind her, getting ready to interfere again. The Prirazlomnaya has requested help from the Russian Coast Guard, who are on the scene, but say they have not received orders to intervene. “Nearly two million people have already joined our campaign to protect this unique region and we will do all we can to keep it off-limits to reckless oil companies looking to profit from its exploitation,” said Naidoo, a South African who has headed Greenpeace International since 2009. Friday evening, after 15 hours hanging from the Prirazlomnaya in an attempt to call attention to Gazprom’s drilling venture in the Pechora Sea, Naidoo and five other climbers came down from the platform went back to their support ship, the Arctic Sunrise. In freezing temperatures, the climbers were constantly hosed with water by Gazprom workers, who also threw pieces of jagged metal shrapnel at them from above. 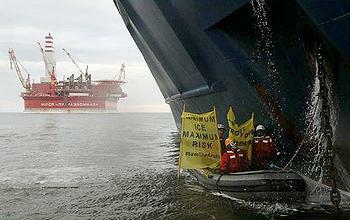 “To avoid unnecessary risk in these freezing Arctic conditions the activists have decided to come down. The same cannot be said of Gazprom, which appears determined to continue its reckless drilling program in one of the most fragile places on Earth,” Greenpeace International said in a statement. “The bravery of all of these climbers interrupted a major Arctic oil operation and by doing so brought the world’s attention to this era defining issue,” said Greenpeace. The Prirazlomnaya is the first permanent oil platform in the offshore Arctic and marks what Greenpeace calls “the creeping industrialization” of the Arctic. The construction phase on the platform is nearly complete, and Gazprom is eager to begin drilling and become the first oil company to commercially produce oil from the offshore Arctic. 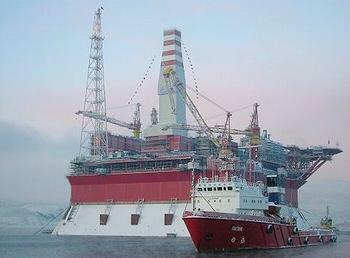 The Prirazlomnoye field will be the first offshore oil field in the Russian Arctic to start production. After numerous postponements, the field is now scheduled to start producing oil early in 2013. Gazprom, the world’s largest natural gas company, has big plans for oil and gas production from Arctic resources Miller told shareholders. In addition to the Prirazlomnoye field, “The Shtokman field development will be the next milestone on the Arctic shelf,” he said. The Shtokman field is situated in the central part of the continental shelf within the Russian sector of the Barents Sea, to the north and east of the Prirazlomnoye field. One of the largest gas fields in the world, the Shtokman field is estimated to contain 3.9 trillion cubic meters of gas and 56 million tons of gas condensate. The Shtokman field will become a resource base for building up deliveries of Russian pipeline gas and LNG to domestic and foreign markets,” Gazprom says. On February 21, 2008 Gazprom, the French company Total and the Norwegian company now known as Statoil signed a Shareholders Agreement establishing Shtokman Development AG, a special purpose vehicle to implement Phase 1 of the project. Gazprom holds 51 percent in the company, while Total and Statoil hold 25 and 24 percent respectively. But Greenpeace warns Gazprom is not ready to prevent spills or clean them up if they occur. “Despite extreme operating conditions, Gazprom has only released a summary of its oil spill response plan to the public. Yet even this document shows that the company would be completely unprepared to deal with an accident in the Far North, and would rely on substandard clean-up methods, such as shovels and buckets, warns the conservation organization. This is why Greenpeace activists are so eager to take action against Gazprom in the icy Arctic waters.